Ah, the tree house—a childhood dream we never entirely get over. Whether you want to share your experience of lording over a one-of-a-kind playhouse in the sky with your little ones or are keen to build them the tree fort you always wish you had, you’ll find plenty of inspiration among these 21 amazing (and totally doable) DIY tree houses. 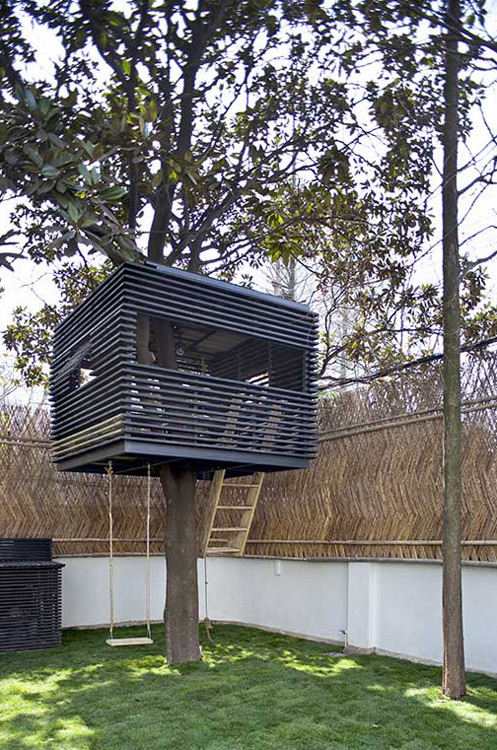 This two-story tree house, featured on Houzz, connects a simple tree platform to a raised shelter via a cargo net passage. It’s the perfect place to hang around and catch the breeze on a warm summer’s day. A solid platform with a small A-frame structure is more than enough to keep imaginative kids at play in this sweet little tree fort from Austin Tree Forts Etc. You could even string up a swing or two from that sturdy, four-beamed base. Though it may sit a little lower to the ground than your average tree house, this pint-sized tree-stump palace, spotted on Made With Happy, will leave your little one on cloud nine. With a cheery yellow interior, clean blue and white striped curtains and little more than a three-foot drop to the grassy ground below, it’s the perfect starter home for an adventuring toddler on the go! This rustic tree house, featured on Houzz, incorporates organic materials and scrap lumber into a simple, understated design that blends nicely into its picturesque garden surroundings. The piece de resistance? A bucket on a pulley—perfect for passing secret messages and other goodies to friends above. Spotted on Houzz, this beautiful custom-made tree house is a childhood dream come true! 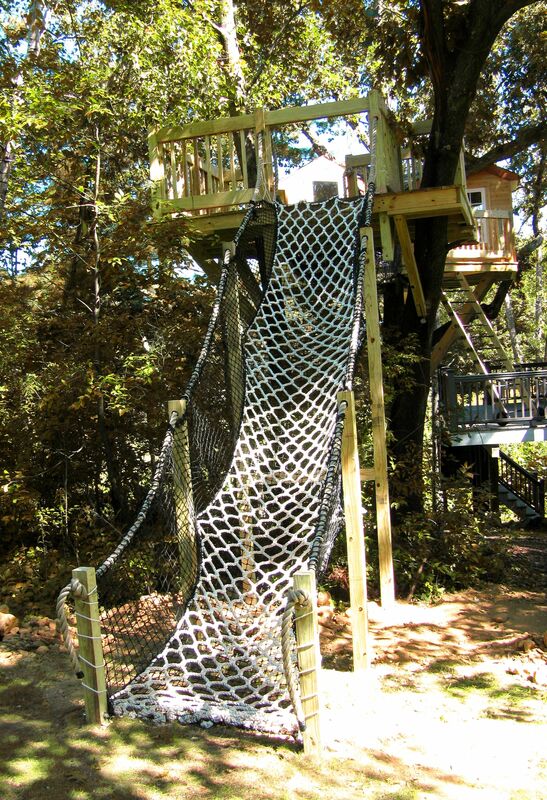 What kid wouldn’t love a multi-decked tree fort featuring swings, a slide and even a rock-climbing wall? And the hand-painted “Little Rascals” inspired signs? Too cute! Looking for a childhood paradise that won’t break the bank? Made entirely of repurposed wooden pallets, this humble tree fort, featured on Homesthetics, cost only $30 to pull together. Add cushions, pillows, blankets, and a string or two of fairy lights, and you’ll have a comfortable hideaway that will entertain your kiddos all summer long. This contemporary re-invention of the classic tree house, created by Austin Outdoor Designs and featured on Houzz, boasts beautiful tigerwood slats, floating stairs and elegant, modern steel frame. This four-post platform tree house, spotted on Instagram, leaves plenty or room for a pair of comfy hammocks suspended below the main deck. It’s the perfect shady spot to curl up with a good summer read. No trees? No problem! Give your kiddos the lofty nest of their dreams (and yourself some more much needed storage) by recreating this shed-top clubhouse spotted on The Playhouse Company. This Asian-inspired tree house, spotted on Distinct Vision, sits atop of an ivy-covered tree stump hidden away in a quiet garden corner. Floaty white curtains and soft gold tassels add to the little hut’s fairy-like charm. With its clean lines, steel foundation, and corrugated plastic walls, this contemporary playhouse, found on Live Journal, is almost sculptural in its beauty, offering everything a kid could hope for with plenty of adult appeal. A small platform on a neighboring tree connected by a cargo net bridge doubles the fun of this beautiful woodland tree house featured by Barbara Butler. A simple A-frame structure with sheltered lookout windows makes for a perfect and easy-to-recreate backyard outpost like this cedar shake shingled beauty spotted on House Mix. For many little ones, the most dangerous part of a tree house adventure is the climb up. This lofty tree perch, spotted on Pinterest, replaces the traditional rope or peg ladder with an easy to climb (and even easier to slide down) cargo net. Have some older and more adventurous kiddos on your hands? Who needs a ladder when you can have a massive rock-climbing wall instead! Found on Posh Home, this summer play sanctuary is not for the weak of heart! With such a wide swath of climbing space, your kids will never scamper up the same way twice! Few tree houses, modern or otherwise, are as eye-catching as this wood-slat cube created by Naço Architectures and featured on DUENDE. Working with a budget? Basic materials and a simple yet striking design make this statement-making tree-fort doable for contemporary design lovers everywhere. A screened-in tree house, like this woodsy-delight featured on TSP Home Décor, is the perfect way to keep those summer pests away, ensuring your little ones get the most out of their summer without the mosquitos getting the most of them! With its bold chevron walls and rustic, multi-toned woods, this simple and versatile tree house, created by blogger and super mom Carrie Bloomston, transforms reclaimed wood and upcycled furniture into an artful and visually interesting play space that’s as beautiful as it is fun! It may be tucked snugly against the ground, but this hobbit-inspired hide-away, spotted on Homesthetics, is a tree house nonetheless! Built around the base of a tree and covered with a rich and grassy roof, this sweet little fairy house offers a nod to the centuries-old tradition of the “cobb house” while creating a beautiful and unobtrusive play space for the little sprites in your life. Cedar shake shingles and a corrugated metal roof add a rich textural dimension to this simple plywood playhouse created by Shannon of Dirt-Digging Sisters. With no tree house-worthy tree in sight, the family had to improvise, incorporating a sapling tree into their design that will hopefully grow into its new digs. Who needs a tree when you can build your own? Made almost entirely of rustic, organic materials and dripping with rich green ivy and hanging plants, this tree-like perch, featured on House Mix, couldn’t look more like the real thing. 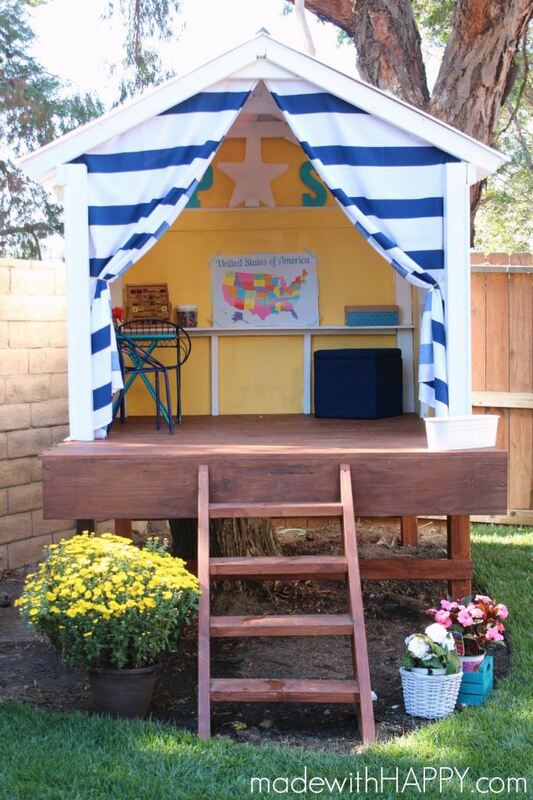 Looking for more inspiring ideas for building the playhouse of your little one’s dreams? Check out this round up of The Best Free and Budget Playhouse Plans, Hacks, and Designs.